How to install “Microsoft Licensed Class Manager 1.0” on my computer? Generally, the Microsoft Licensed Class Manager is an ActiveX control that is installed with Internet Explorer. 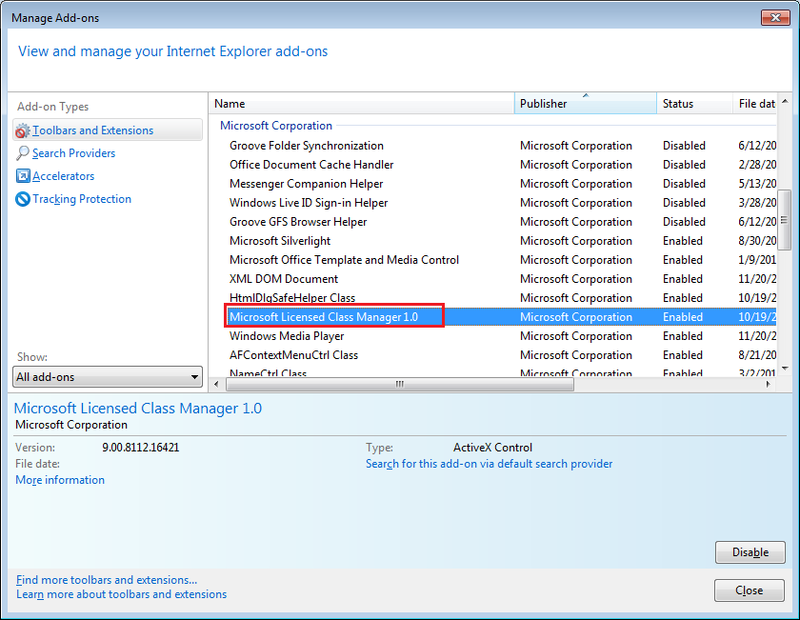 To check if Microsoft Licensed Class Manager is installed in IE, please open the Manage Add-ons box that can be launched from menu Tools -> Manage add-ons. Some IE versions may not list it in the add-on list. You can check under "C:\Windows\System32" or "C:\Windows\SysWOW64" for licmgr10.dll. If the Microsoft Licensed Class Manager is not installed, please follow the steps below to install the add-on. The dialog box of the security setting can be launched from the menu Tools -> Internet Options. Then select the security tab. If you are using Windows Vista/7/2008, please try with the following steps. 1). Turn Protected Mode off. 2). Add the website to the zone of trusted sites. 3). To temporarily elevate permissions of IE: click Start, point to All Programs, right-click IE, and then select Run Elevated (with Administrator permissions). Access the TWAIN-related web page and you will be asked to download the add-on: 'Microsoft License Manager DLL'. Click to install the Add-on.